Named after Charles Wilkes [1798-1877], leader of the United States Exploring Expedition [1832-1842] that covered most of the southern hemisphere. Acalypha wilkesiana forma circinata Müll.Arg. Acalypha wilkesiana forma illustris J.J.Sm. Acalypha wilkesiana forma macrophylla J.J.Sm. Acalypha wilkesiana forma monstrosa J.J.Sm. 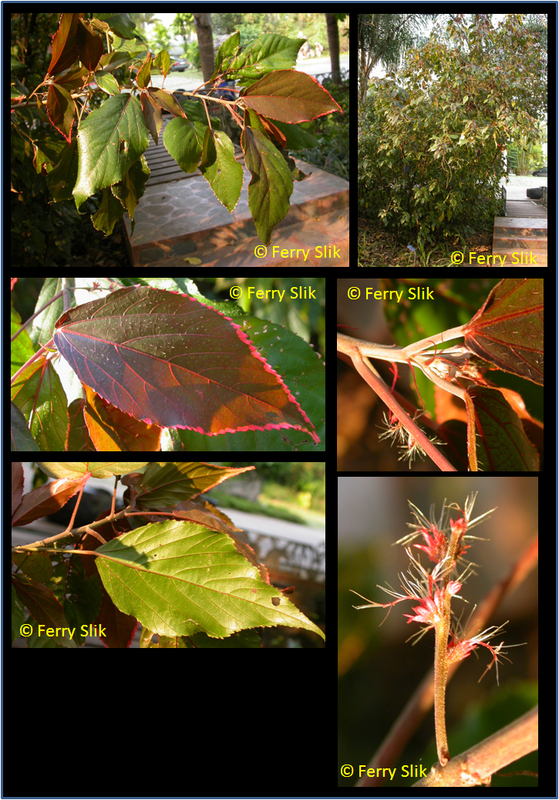 Acalypha wilkesiana forma triumphans (L.Linden & Rodigas) J.J.Sm. A densely branched rounded shrub up to 12 m tall, monoecious, tomentellous to pubescent. Petioles 15 cm long. Leaf blades usually up to 15 10 cm, sometimes larger, elliptic-ovate to broadly ovate, obtusely acuminate at the apex, crenate-dentate on the margins, cuneate or rounded at the base, 57-nerved from the base, membranous, sparingly pubescent along the midrib and main veins on both surfaces at first, later glabrescent, green, copper or bronze and variously variegated with purple, red, pink, cream-coloured or white, or else pink-, cream- or white-margined; lateral nerves in pairs. Stipules 7 mm long, narrowly lanceolate, acutely acuminate. Inflorescences axillary, usually solitary, spicate, unisexual, on the same or different shoots. Male spikes up to 12 cm long, densely but interruptedly flowered; bracts minute, many-flowered.Female spikes up to 7 cm long, lax flowered; bracts c. 5 mm, ovate, later accrescent, dentate, with 36 teeth on each side, sparingly pubescent to subglabrous, 1-flowered.Male flowers sessile or so; buds tetragonal, subglabrous, reddish; anthers yellowish. Female flowers sessile; sepals 34, 1 mm long, ovate, subacute; ovary 1.5 mm in diameter, subglobose, tomentose; styles c. 6 mm long, united at the base, deeply laciniate, red. Fruits 4 mm, 3-lobed, pubescent. Disturbed open sites. Often in gardens, along roads, in villages. Originally from the south-western Pacific, but currently world wide in (sub-)tropical climates where it is often introduced as an ornamental. English: Beefsteak plant, Copper leaf, Fire-dragon, Joseph's coat, Match-me-if-you-can. Indonesia: Daun nansi (Sunda Islands). Papua New Guinea: Kavus (Lamasong, New Ireland), Kokoai (Raluana, Gazelle Peninsula, New Britain), Haunuana (Delena, Central Province). Puerto Rico: Acalifa, Capa de obispo. Thailand: Pho ngoen, Pho daang (central), Bai ngoen (southeastern).